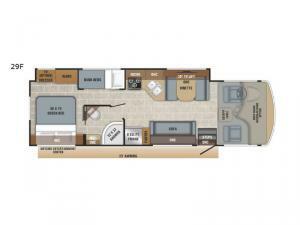 Luxury, comfort and lots of floor space are provided in this Alante bunk bed model. Just imagine a full wall slide behind the driver's seat offering plenty of room for everyone to move about freely from one end of the coach to the other end. You know the kids will love their own bunk bed while you enjoy the master bedroom's queen bed. You will also find a dual entry full bathroom with a radius shower and all the amenities necessary to skip the rest stops. Now imagine relaxing outdoors around the exterior entertainment center with an LED TV including a DVD/AM/FM radio and speakers. You might like to add a few options such as a drop down overhead bunk, 12 cu. ft. refrigerator, and/or a theater sofa. 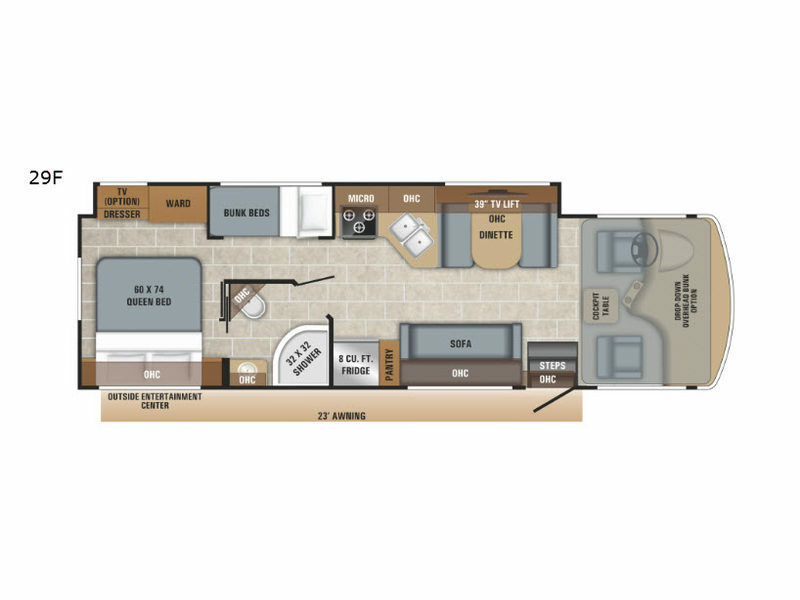 The Alante class A gas motorhome comes equipped with Jayco's proprietary JRide package, including a computer-balanced driveshaft, jounce bumpers, front and rear stabilizer bars and SACHS shocks offering best-in-class handling. You will appreciate the 120' panoramic windshield equipped with oversized wiper blades to allow for maximum visibility, and the industry's largest travel-view window in the entrance door providing amazing views and extra natural light. Inside, you will find high-intensity recessed LED ceiling lights, ball-bearing drawer guides and hardwood cabinetry, plus Soundstream Infotainment dash radio with GPS and CD/DVD player. Your home on the road is waiting for you, choose your favorite Alante!